One of the new products that Telerik will be releasing next week during the big Q2 2008 release activities is our brand new charting product for WPF. Officially dubbed RadChart for WPF, our latest entry in the charting field is really stepping-up what Telerik has done in the past with charts. The new charting engine is going to deliver unprecedented 3D and 2D charting capabilities in a characteristically easy to learn and use Telerik component package. Everything from directional light sources to animated charts to gauges will be part of the new data visualization package, so we think you're really going to enjoy the new tools. Now, what's being released next week during Q2 won't be version one. Instead, it will be a CTP that's designed to give you an early preview of our work in this arena. The final release will likely coincide with our Q3 release later this year. And while we wait for that date, Telerik will be actively listening to your feedback and striving to build the most useful charting tools you need. And don't forget Silverlight! Remember, we build our WPF and Silverlight controls on the same code base. That means you'll eventually see RadChart for Silverlight, too, and when you do the API will be nearly identical to RadChart for WPF (though some of the more advanced 3D features may not be available in Silverlight, for obvious reasons). That means code you write for RadChart for WPF will be reusable in all of your Silverlight applications and vice versa. That should impress your boss and make your life a lot easier when management comes asking for a web version of your cool WPF application. Download the RadChart for WPF CTP next week and start letting us know what you think! Until then, check out this quick sneak peek video I've created to give you a glimpse of the features we'll be packing-in to next week's CTP. I have a question about the charting, if I understand correctly, Telerik is planning to offer charting for Silverlight too in the future. When that happens, will we be able to use the produced charts in other formats as well? For example I'd like to be able to print a chart, or to include one in a PDF. Would that be possible? @Martin- If you're targeting print, I'd suggest using Telerik Reporting. It is best suited for designing items that need precise page layout and it also includes its own charting support. Check it out at http://www.telerik.com/reporting. Does that help answer you question? Wow! Yet again green/blue thingies from Telerik... You know there are other colors out there. 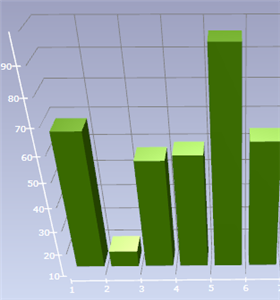 Please check some of your competitors how a nice 3D chart should look like (no, it's not a star-shaped chart). Todd, I mean the ability to print the chart image. Indeed currently Telerik Reporting can be used, or RadChart for ASP.NET too. But what I see is that this new WPF (and possibly Silverlight) charting version is different from the current Reporting/ASP.NET RadChart version, as that it offers 3D charting for example. Or is it the case that this will be offered in other RadChart versions too? I'm basically looking to add 3D Radcharts into my custom made PDF's in a web environment (currently ASP.NET, perhaps in the future Silverlight). @Anon- Thanks for the note on the colors. I remind our designers that there are more colors on the color wheel. @Martin- I see what you mean. At the moment, the new 3D stuff is primarily headed toward WPF and Silverlight since it's XAML-based. If the interest and demand are high enough, though, it's possible this tech could find its way to an image-based format you can use in something like PDFs. I'll pass your feedback along and we'll keep this in mind as we form our plans.